Apply for a Production Internship! Interested in learning more about film production, editing, and working with professionals? Apply for this on-site, after school internship with Derrick Comedy Productions. 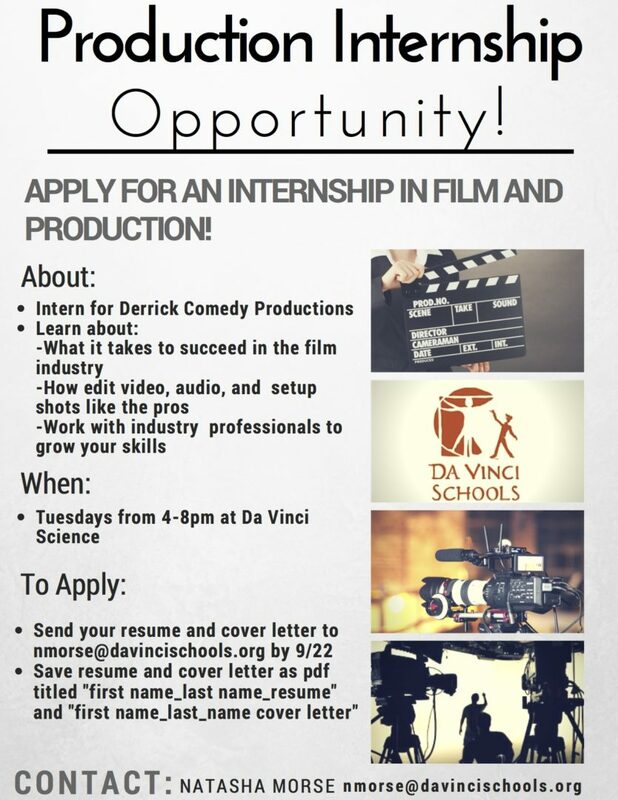 You will be interning remotely with a cohort of other Da Vinci interns on projects assigned by Derrick Comedy Productions on Tuesdays from 4-8pm at Da Vinci Science. To apply, send your resume and cover letter to nmorse@davincischools.org saved as a pdf entitled “first name_last name_resume” and “first name_last name_cover letter” by Sept. 22nd. This week, all students will be signing up for seminars. These are live sign-ups, meaning you will share your preferences with a teacher or counselor and you will be enrolled on the spot if there is still room in the seminar you would like. Seniors will do this today (Wed 8/30) during advisory and juniors will be tomorrow (Thurs 8/31) during advisory. Sophomores will sign up during advisory on Friday 9/1 and freshman will sign up during their Art & Design period on Friday 9/1. Seminars begin on Wednesday 9/6. Designers, thank you for an incredible first week back. We were thrilled to see your smiling faces on Tuesday morning – the campus was full of energy and excitement! 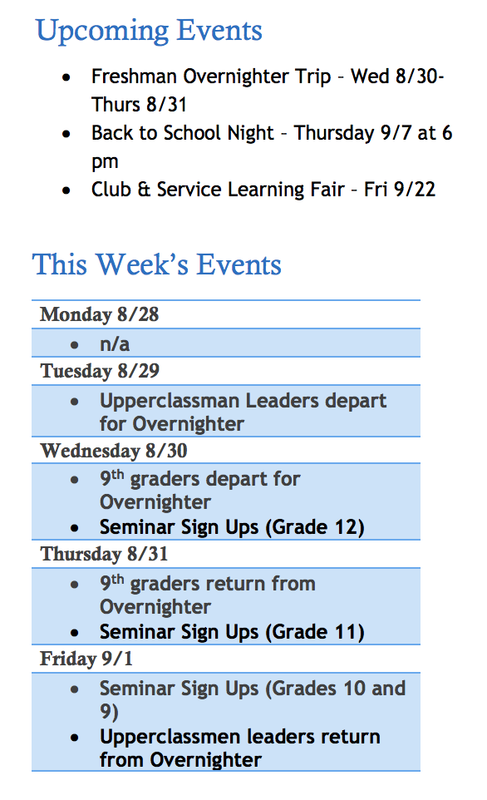 Next week, our 9th graders will be attending the Overnighter on Wednesday 8/30-Thursday 8/31. Please complete your permission slip! You should have received this from your English 9 teacher. Seminar sign-ups begin next week. See the daily updates for details on when your grade level will sign up. A preliminary list of choices can be found HERE. Juniors and Seniors – if you are interested in taking a college class during your seminar, we have two amazing opportunities! On Mondays and Wednesdays from 3:00-5:15, El Camino College is offering their Ethnic Studies 1 class. On Tuesdays and Thursdays from 3:00-4:00 (plus online work), West Los Angeles College is offering their Music Appreciation 111 class via a hybrid model. Both courses are FREE for Da Vinci Design students. See this FLYER for more details and talk with your counselor. There will be a meeting for Rock Band on Wednesday, 8/30 at lunch in Toby’s room if you are interested in joining. Senior Families- Sign up for your Individual Senior Family Meetings with your student’s College Counselor! Da Vinci Design’s College Counselors will be holding individual senior family meetings throughout the month of September. Sign up early to reserve a day/time most convenient for you. An informational handout will be given to your student. Click on the link below to sign up for your meeting via your counselor’s Sign Up Genius (Make sure you sign up for meetings with the appropriate counselor, caseload is divided based off last names). First Day of School (August 22) Reminders! The new school year is almost upon us! We are so excited to welcome our new DVD family members as well as those of you who are returning. The first day of school is Tuesday, August 22 and we start promptly at 9:00 am. 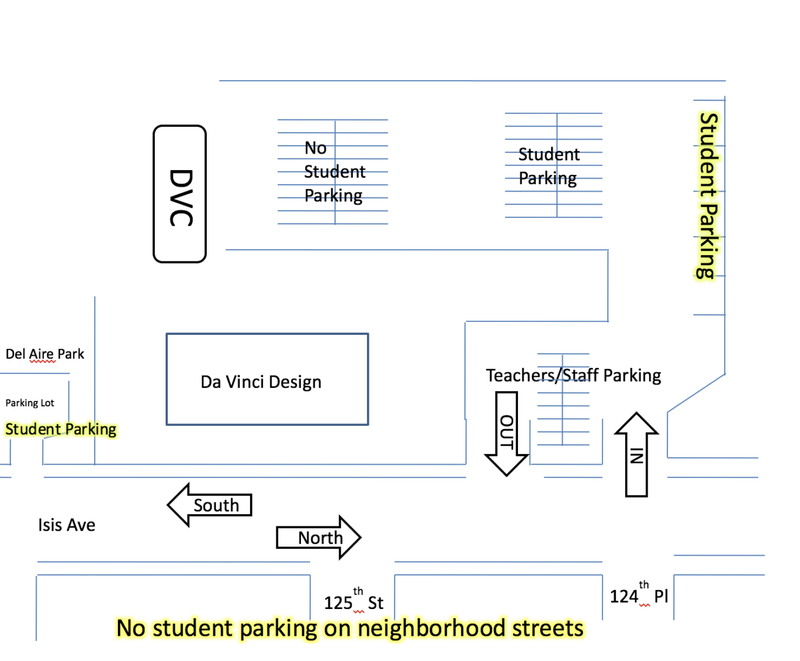 We are starting the year at the Da Vinci Design campus located at 12501 S. Isis Ave in Hawthorne as our new facility is not quite yet ready for us. We suggest arriving between 8:30-8:40 to avoid heavy traffic during drop-off. Please review the previous post regarding traffic safety, flow and etiquette. Students will receive their schedules in their Advisory class, which is the first class they attend on Tuesday. If your student is unsure who their advisory teacher is, there will be giant signs hanging on the front gate. They are broken down alphabetically and by grade-level. Find your name and you will be able to see the name of your advisory teacher next to it. Administrators and counselors will be available to help students get to the appropriate classrooms. Here’s to another amazing year at DVD. We’ll see you soon! DVD families, we are very much looking forward to the start of the 2017-18 school year on Tuesday, August 22. 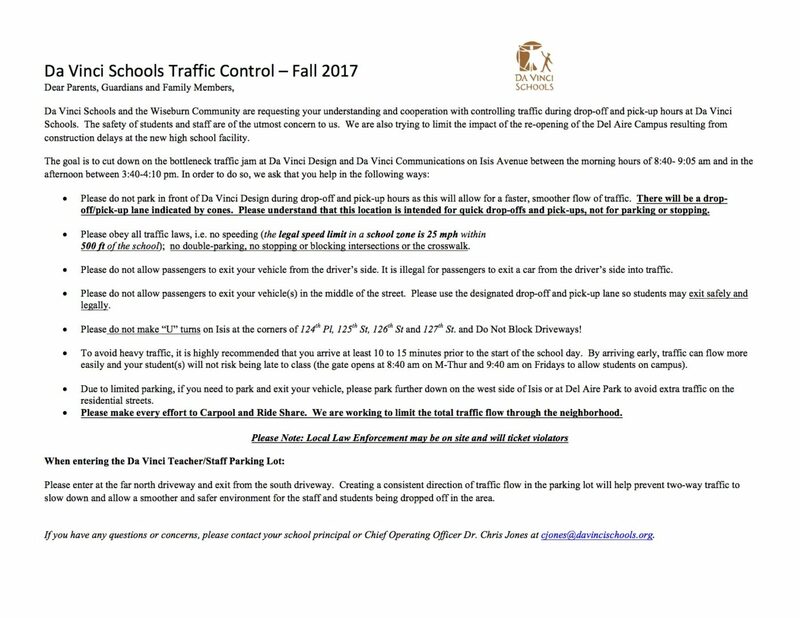 Student safety at drop-off and pick-up is a top priority, so please take the time to read the letter below to learn more about traffic flow patterns for drop-off and pick-up as well as general rules and expectations. Hello Designers. We hope you are having a nice summer. We want to inform you that PowerSchool is disabled while we are working on student schedules. You will not be able to log in or access any of the information stored there this week. Many times, we go through many iterations of a schedule before it is finalized, so much is still changing and being edited. You will receive your schedule on the first day of school as in all past school years. We look forward to welcoming you back on August 22nd!